Okay! Sorry for keeping everyone in suspense! So we finally got the baby's gender confirmed because I had my detailed scan at NUH today! Great news cause all is well with the little one! The professor came in after the sonographer had scanned me and the first thing he said when he saw the ultrasound was "Why this baby so fat!" hahaha! I got a little worried then cause I thought he meant that something was amiss but thankfully all is fine! Just carrying a chubby little bunny in my "pouch"! It's no wonder I'm showing so much more now compared to then! They say durians make you have a bigger baby, I don't know if that's a myth or what but I definitely had a lot more durians during this pregnancy. I told the prof about Ky's birth weight and he said Ky was really small? haha! Maybe Ky has Shane's petite genes and this baby has my giant genes. Anyway, here's the pictures from today's ultrasound! see if you can guess the baby's gender right! 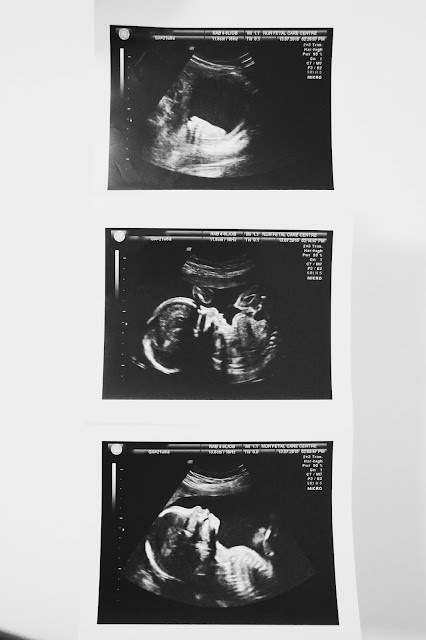 Baby was really active during the scan, kicking away immediately after I laid on the bed so I had a really enjoyable time seeing the little one's movements on screen while I feel it in my belly! I've been resisting the urge to go baby shopping for the past few months just because we couldn't get a definite answer yet but once I got to know, I immediately went baby shopping at Vivo City cause I happened to be passing by! I shall stop keeping you guys in suspense already and cut to the chase! Yes, another little princess! Did you guess it right? hahaha! Most of you would have probably hoped for a boy but I'm pretty happy it's another girl cause baby girl's clothes are all sooooo pretty! It makes baby shopping very exciting! Plus! I can save a lot reusing Kylie's clothes! Can't wait to dress the little one up when she's out! We've thought of a name for her but I'll save that for another post!